I often used to take my lunch to work in a Zojirushi Mr. Bento -- this Mr. Bento. More recently, I take it out for use once a year, to bring my meal to our synagogue's sukkah for a Sukkot. 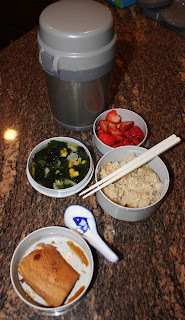 This year, I made a spicy soy sauce poached mahi mahi fillet, with brown basmati rice, a dashi broth with corn and wakame, and a dessert of sliced strawberries and balsamic vinegar.